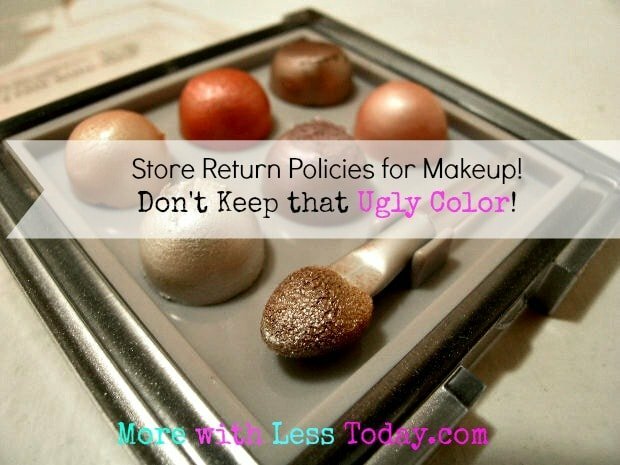 Return Makeup Policies at Drug Stores - Don't Keep that Ugly Color! Sometimes the lighting in the store is terrible. Sometimes you cannot see the true color through the packaging. Sometimes you buy new makeup and realize that you have something just like it at home. Sometimes just buying a new lipstick makes life better, then the color turns out to be awful. Stuff happens. Don’t relegate unwanted makeup to that drawer or under the counter, never to see the light of day! Return it and get what you need. There are several stores with good return policies for makeup. If you buy makeup that does not work out, save your receipt and return it. I have done this at CVS several times without any hassle. Don’t let unwanted makeup sit unused in a drawer. CVS Pharmacy: You may return beauty items open or unopened within 30 days. Our hassle-free return policy allows you to return nonprescription products to any CVS/pharmacy store or by mail within 30 days of receipt. 100% satisfaction guarantee on beauty purchases. Be 100% happy or receive 100% money back on any beauty products. If you’re dissatisfied for any reason, you can return the beauty product (opened or unopened) along with your receipt or invoice to any CVS/pharmacy store. We’ll refund the full purchase price — no questions asked! Rite Aid: You may return beauty items open or unopened within 30 days. The Rite Aid 100% Risk-Free Beauty Guarantee. Any opened or used beauty product of any brand name can be returned for a full refund when accompanied by a register receipt. Beauty categories subject to the guarantee are skin care/depilatories, sun care, bath/soap, hair care (shampoo, conditioner, styling and professional), hair color, cosmetics, ethnic beauty aids, fragrances, cosmetic organizers and personal care appliances. Per their website: You may return beauty items open or unopened within 90 days with exception to an item designated as ORM-D. Most items can be returned within 90 days of receiving it. The chart below lists exceptions to this policy as well as instructions on how to return certain types of items. HEALTH & BEAUTY – If the item is designated as ORM-D (Other Regulated Materials-Domestic), it must be returned in its original package. If returning by mail, it must have secure ORM-D packaging obtained from the post office. ORM-D items include perfumes, nail polish, and aerosol cans. Walgreens: You may return beauty items unopened within 30 days if opened returns are per the discretion of the store manager. Target: You may only return beauty items if they have not been opened yet within 90 days. Most unopened items in new condition and returned within 90 days will receive a refund or exchange. Some items have a modified return policy noted on the receipt. Target policy board (refund exceptions), Target.com or in the item department. Items that are opened or damaged or do not have a receipt may be denied a refund or exchange. Do you know of any other stores with good return policies for makeup? Share in the comments so I can tell everyone! Direct selling companies such as Avon (and Mary Kay) have the best return policies for opened and unopened makeup. You can return product to the representative you bought it from up to one year. If product is older than one year, you can return directly to the company. Q: Can I return beauty products that have been opened? A: Most beauty items bought in stores or online can be returned, even if opened, within 90 days with your receipt, or up to 120 days if purchased with your Target REDcard™.